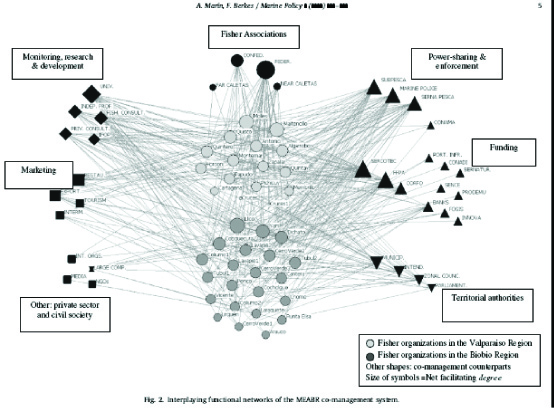 A network approach to understand co-management, governance and complex social-ecological systems is becoming part of the toolbox used by researchers in our field, now recently in an article by Marín and Berkes (see below). A bunch of us is trying to form a community of researchers to exchange ideas on how to use network analysis in social-ecological studies and to join our NASEBERRY group, you can mail me (Henrik Ernstson, henrik(at)ecology.su.se). Within the field of social-ecological network studies, several other studies are on their way in both marine, terrestrial and urban ecosystems. Further, at the upcoming international conference on social network analysis (SUNBELT) there is a special session on network analysis and natural resource management (June 2010), and several of us are participating in a book project led by Örjan Bodin and Christina Prell to further develop this field. It is clear that several reserach groups are forming at various universities in the world, and at all continents. We hope our NASEBERRY group could be a good forum for many others to exchange exciting ideas. The name originates from “Network Analysis in Social-Ecological Studies” but has further borrowed its name from a long-lived evergreen tree growing in the Caribbean. The group include scholars that strive to advance both social, ecological and social-ecological network analysis in social-ecological studies. If you would like to join, please contact me Henrik Ernstson (henrik(at)ecology.su.se). Stay cool. Stay networked. 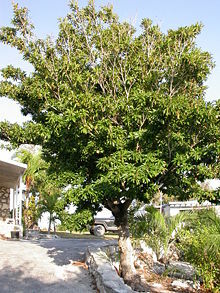 Stay in the (naseberry)tree! With reference to: Armitage et al 2007: Adaptive co-management. Univ Brit Col Press. My name is Irendra Radjawali, I am an Indonesian Ph.D candidate at Faculty of Geography, University of Bremen and Leibniz Center for Tropical Marine Ecology-Bremen. Interesting research and in line with our research that we conduct in Spermonde Archipelago in Indonesia on Reef Fishery (consist of Live Reef Food Fish, Coral Trade, and Ornamental Fish Trade). 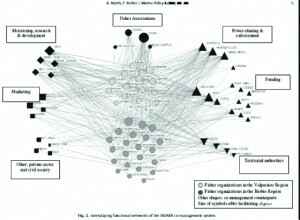 Our findings confirm that it is important to understand the dynamic of cooperation and competition in social networks in social-ecological sytems, in our case, the reef fishery. If it is possible, we would like further exchange and elaborate the use of social network analysis on governance of social-ecological systems. Thank you.